Angus’s Jupiter has an aluminium body on a tubular steel chassis with a 60 HP flat four 1486 cc engine and a 4-speed column change gearbox. Jupiters were class winners at Le Mans in 1950, 1951 and 1952. XXT 59 was first registered in Hong Kong in 1952 where it was owned by a Lieutenant-Commander in the Fleet Air Arm. Almost certainly, this explains the very rare two-tone grey colour scheme. The car was imported back to the UK in 1959. Having bought it from Simon J Robinson at Darlington in 1999, I am the fourth owner of the car. 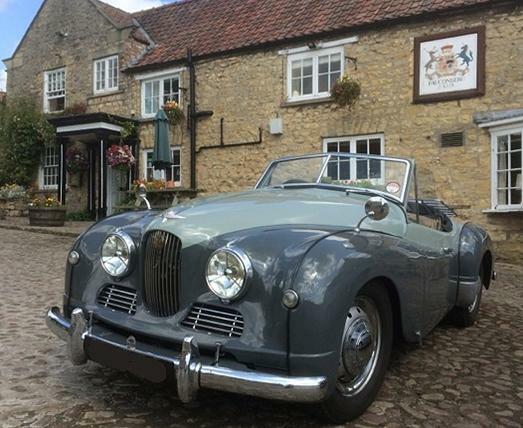 Shirley and I have used the Jowett to tour France, Denmark, the Isle of Man and Scotland. It is a surprisingly comfortable car and the combination of stainless steel exhaust and flat four engine provides a very satisfying burble. Our retired Chairman Craig Scaife recently re-built an engine for me which I am currently fitting.